History of two cases of extra-uterine pregnancy. Description : [1 l.] pl., 151-156 p., ; ill.: 1 phot. fig. ; 23 cm. Photograph : photoengraving on printed leaf. Photographer : Dr. Moses Greely Parker (1842-1917). Subject : Uterus & adnexa — Tubal pregnancy. Author caption: By Prof. Augustus C. Bernays, A. M., M. D., Heidelberg, M. R. C. S., Eng., of St. Louis, MO. Medical degree, University of Heidelberg, 1876. Qualified, Member of Royal College of Surgeons, 1877. Professor of anatomy and clinical surgery, College of Physicians, St. Louis, 1883. Reprinted in part: Martin & Cushing (1890), Pathology and therapeutics of the diseases of women ; Boston, p. 629. GM-3518 first excision of the stomach. On Sunday morning. May 23, at the request of Dr. Wichmann, I performed the post-mortem with the assistance of Drs. Bremer and W. H. Heidorn. 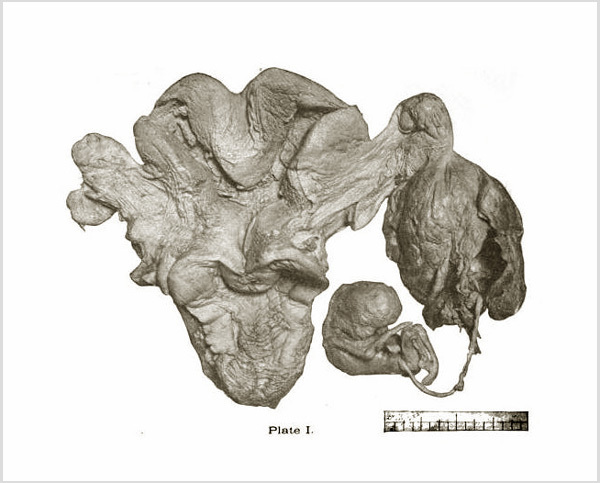 It was one of the most interesting post-mortem examinations I ever performed, and it brought to light a unique specimen, which is beautifully illustrated by the photograph Plate I., for which we are indebted to the skilful and conscientious work of Dr. M. G. Parker.—Page 156.